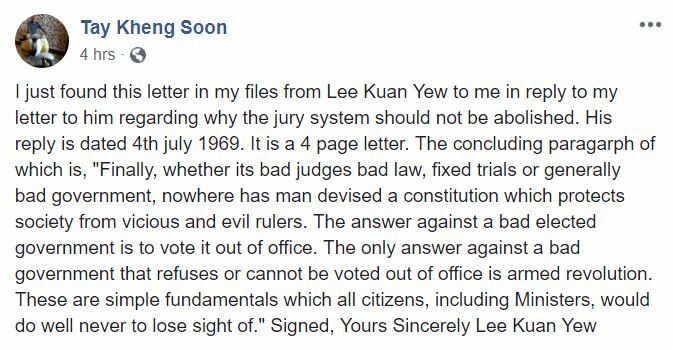 Veteran architect Tay Kheng Soon revealed today that founding Prime Minister Lee Kuan Yew wrote to him that “The answer against a bad elected government is to vote it out of office,” in a letter back in 1969. Mr Tay, the architect behind iconic structures in Singapore like KK Women’s and Children’s Hospital, Golden Mile Complex and the People’s Park Complex, shared that he just stumbled upon the letter from Mr Lee, dated 4 July 1969, among his papers. “Finally, whether its bad judges bad law, fixed trials or generally bad government, nowhere has man devised a constitution which protects society from vicious and evil rulers. 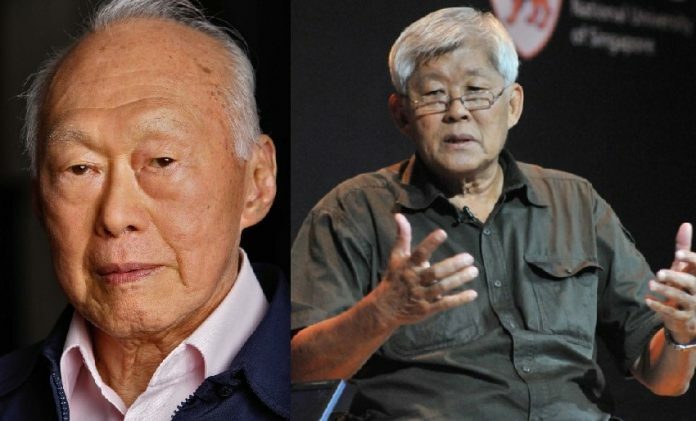 Mr Tay has been critical of the Government in the past and has asserted recently that the People’s Action Party (PAP) Government should take a “drastic self initiated pay cut” in order to regain the moral authority he feels they have lost. Last October, Mr Tay – who presently serves as Adjunct Professor at NUS’ Department of Architecture) – gave a talk on the past, present and future of Singapore. National Geographic asked LHL: What is your role? We have no vision. No vision, no future. No daring, no enterprise, no Singapore.We need doers and thinkers, but we only have tweakers and grumblers. We are not short of land.Land shortage is a strategy to increase land price. "I have always said that URA is land sales agent of the state pretending to be a planner."